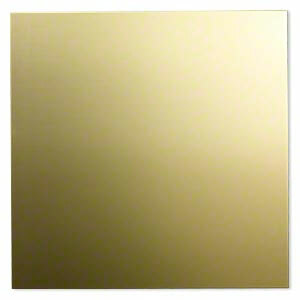 Half-hard jeweler's metal sheet is suitable for milling, forming, etching, punching, embossing and antiquing and is polished to a mirror finish. Also known as Merlin's gold, jeweler's bronze is an alloy of 85% copper and 15% zinc. Use a felt-tip or ballpoint pen to draft designs on the sheet. Cut with a jeweler's saw for clean edges. Sheet can be used with the Epic™ Six QuicKutz® embossing tool.